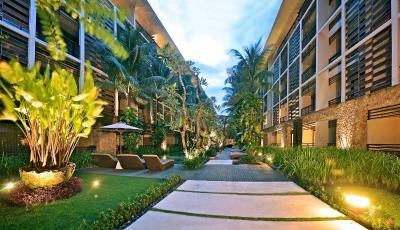 Lock in a great price for The Haven Bali Seminyak – rated 8.4 by recent guests! I love the environment. I mean, it is centrally located, not too far from beach but there is still night life in front of the hotel and it still quiet being in the hotel compound. Totally great for someone who want to relax and prefer some privacy. The room is spacious, they have this big wall mirror and the balcony is amazing place to relax. I like the breakfast a lot too, croissant super soft, thumbs up for that. My sister and I had our best time in the spa. Definitely worth out money. The hotel staff is so friendly and smile a lot. They made our stay totally in comfort. I called the reception to providing us with ironing facilities and it arrived in less than 10 minutes to our room. I really appreciate that. Thank You! I like it so much this time of booking is because I'm upgraded to suites room is so wonderful. Thanks for the upgrade. Really appreciate. Location was very good. Buffet breakfast was delicious and had a lot of options. Relatively nice hotel with good location. Some good resturants in the area and the food (lunch) at the hotel was surprisingly good, though a bit pricy (to be expected in a hotel). Decent breakfast with many alternatives. Extensive breakfast offerings and convenient location in Seminyak. The staff were soooo nice. And eating dinner while watching the Bali traffic was surprisingly relaxing. The location is perfect, beach is 10 min walking distance, nice restaurant/bar with entertainment that is open 24/7. Great staff, everything is clean, comfortable bed. Beautiful lobby and pool areas. The Haven Bali Seminyak This rating is a reflection of how the property compares to the industry standard when it comes to price, facilities and services available. It's based on a self-evaluation by the property. Use this rating to help choose your stay! A 10-minute walk from Seminyak Beach, The Haven Bali Seminyak Hotel has accommodations with flat-screen TVs and free Wi-Fi. The elegant hotel features a swimming pool and 2 dining options. The elegant rooms at The Haven Bali Seminyak have balconies and plenty of natural light. Each room has a minibar and tea/coffee maker. Select bathrooms have a bathtub. Guests can enjoy a range of beauty and body treatments at ATMA Spa, or work out at the fitness center. For convenience, the hotel also provides laundry services and free parking. Sabeen Restaurant serves a variety of organic dishes, and Italian food is available at Lemon Cello. The Haven Bali Seminyak is half a mile from Legian Beach and 2 miles from Kuta Square. Ngurah Rai International Airport is a 15-minute drive from the hotel. Free shuttle services to Seminyak Beach are provided. When would you like to stay at The Haven Bali Seminyak? Featuring a unique minimalist design, this modern room comes with flat screen cable TV, DVD player, coffee/tea maker, and mini-bar. The bedroom is beautifully furnished with plush queen or twin beds with interconnecting access. The private bathroom has shower or bathtub. The room has a balcony overlooking the pool. Please note that this room cannot accommodate extra beds and only 1 child is allowed to share existing bed with the parents. Featuring a unique minimalist design, this spacious and air-conditioned suite comes with a well-equipped kitchenette, separate living area with flat-screen cable TV, DVD player, and an iPod dock. The bedroom is beautifully furnished with a comfortable bed, a wardrobe, personal safe, and an private bathroom which has bath and shower facilities, hairdryer, slippers, bathrobes, and free toiletries. Please note that based on availability, only 1 extra bed can be accommodated in this suite with an additional charge. Featuring a unique minimalist design, this spacious and air-conditioned suite comes with a well-equipped kitchenette, separate living area with flat-screen cable TV, DVD player, and an iPod dock. Each bedroom is beautifully furnished with a comfortable bed, a wardrobe, personal safe, and an private bathroom which has bath and shower facilities, hairdryer, slippers, bathrobes, and free toiletries. This spacious 1-bedroom villa features luxurious interiors and offers more privacy. It also features an outdoor private pool and a secluded outdoor dining area. This villa is fitted with a flat-screen TV, an iPod dock, and a kitchenette. Guests can enjoy personalized butler service. Guests can also enjoy in-villa breakfast or cooking class activity. This twin/double room has a balcony, tumble dryer and flat-screen TV. The Haven Seminyak is conveniently located in the heart of Seminyak area and offers easy access to the beach, shoppes and restaurant. House Rules The Haven Bali Seminyak takes special requests – add in the next step! The Haven Bali Seminyak accepts these cards and reserves the right to temporarily hold an amount prior to arrival. Guest must use a credit card which would directly be charged or pre-authorized during booking. Guests are also required to present the same credit card used upon reservation for verification upon check-in. Failure to produce the credit card may cause the reservation to be canceled without refund. Debit cards or cards that have debit and credit card functions must not be used. If the guest who made the booking is not the same as the guest who will check in, hotel will email guests a billing authorization form. Guests are to complete and sign the form before sending it back to hotel together with a copy of the credit card used for booking and their ID. Please note that bedding type, extra bed, and crib request as well as babysitter service are subject to availability. Extra bed is only available at the suite and villa categories at an extra charge. A maximum of 1 extra bed can be accommodated per room and is inclusive of breakfast. Breakfast is served based on the standard occupancy for each room type, except for guests booking the room-only option. Additional guests including children will be charged for their breakfast directly at the hotel. It was just perfect. We really enjoyed our stay there. Staff super friendly, room perfectly clean. Location was great. Staff were super friendly. Pool area was relaxing. We loved it! We always stay at The Haven and it never dissapoints us. The staff are absolutely beautiful. The breakfast is yummy & the hotel itself is the best. The prices of the drinks were not that competitive compared to other places nearby. The staff were very friendly and attentive. The room was great - very spacious. Loved our room for what we paid, fridge could of been stocked with some milk to make coffee & tea. Cocktails were pretty average for what you paid but other then that it was amazing. Loved the pool, service and room. The housekeeping staff open our room door without our permission. When i question him, he said he wanted to check if we have any laundry to clean. 1. I am checking out on that day @ 12pm and you open our door @ 10.30am for laundry? 2. My wife is sleeping naked in the bed. Do you think this is acceptable? Not for me. So my advice is keep your clothes on unless you dont mind surprise visit and dont leave your valueables in the room. The bar across the road plays loud music til 3am, luckily we were so tired we slept through it. Breakfast was ok.
Central location, friendly staff. Good value for what you pay. Nice pool. Great Breakfast with an amazing staff! We enjoyed the seafood bbq as well! Most of it. Not family friendly, no kids club. No kids activities, room very run down and dirty. Not a 5 star hotel. Maybe a 3 star if that, aircon hardly works. Just don’t do it. Spend your money somewhere else. Food at the restaurant could be better. The Location and the welcome drinks is so refreshing. Most health drink at the restaurant are great taste. Loved everything about this hotel - The breakfast buffet was amazing. We had a big family wedding and we all stayed at the hotel - the staff was amazing often making special accommodations for us in the dining room which allowed us all to sit together for meals. My suite was beautiful and quiet. The pools were lovely and gave us a great place to hang out together. There was always transportation available. It was magical!